Sorry I haven't been posting as much lately, but I've been trying to be good and not make too many sweets. I've been tracking weight watcher points and my friend Bekka and I started the Couch to 5K plan. We are on week two - yay us! Swim suit season is just around the corner, so we have to stay focused! I've been pretty good about staying within my WW points plus, but I need something sweet after dinner. And it has to be chocolate. 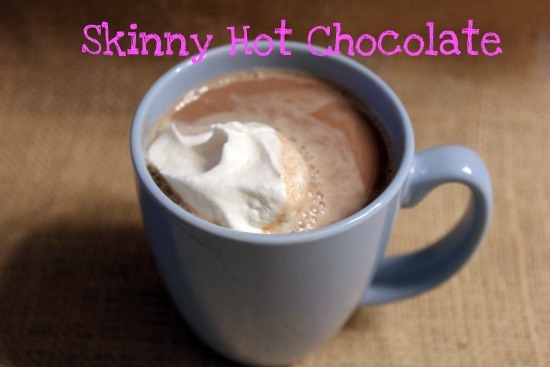 It has been really cold aroud here the past few days, so this Skinny Hot Chocolate hit the spot tonight! I've been trying to give up as many artificial sweeteners as I can, besides my beloved Diet Coke, so I been using stevia. It's a little pricey, but healthier for sure. I tried it in this recipe and really like it. I can't wait to hear your WW and/or running tips! Whisk together the milk, cocoa powder, and salt in a small saucepan over medium heat. Cook until milk starts to steam. Turn off heat and whisk in the vanilla extract and stevia. I can offer no advice, since while I am reading this I am munching on chocolate chips and drinking milk....sigh. Mmm, that sounds great. Does almond milk have a taste like amaretto or almond extract? Where do you find it?